See you at TechEd in Houston! In just two weeks it’s time for TechEd North America in Houston. We will both attend this year, and Johan will spend quite a few hours as a Technical Learning Guide in the HOL/ILL area. This entry was posted in Uncategorized and tagged 365lab at teched, TechEd, TechEd North America 2014 on April 26, 2014 by Johan Dahlbom. Important note: The end of an era with licensing scripts is near… and the beginning of a new one with Azure AD Group Based Licensing is here. Group Based Licensing is now in preview and currently requires a paid Azure AD Subscription. Try it out and give Microsoft your feedback on how they can make it even better! The never ending story about Office 365 licensing continues… This time it’s an extension of my script to assign licenses based on groups, with additional functionality to remove and change licenses for users. IMPORTANT: Since the script actually will remove licenses for users that are not in any of the groups, you have to make sure that you populate the license assignment groups prior to first time running the script. Apart from the above, the script requirements and setup details are the same as in this post. Write-Output "Checking for unlicensed $license users in group $GroupName with ObjectGuid $GroupID..."
#No licenses currently assigned for the license in scope, assign licenses to all group members. Write-Warning  "Group $GroupName is empty - will process removal or move of all users with license $($AccountSKU.AccountSkuId)"
#If no users are a member in the group, add them for deletion or change of license. #Process all users for license assignment, if not already licensed with the SKU in order. Write-Output "SUCCESS: Licensed $User with $license"
Write-Warning "Error when licensing $User"
#Loop through to check if the user group assignment has been changed, and put the old and the new license in a custom object. #Only one license group per user is currently supported. #The user were assigned to another group, switch license to the new one. Write-Output "SUCCESS: Changed license for user $User from $($ChangeLicense.OldLicense) to $($ChangeLicense.NewLicense)"
Write-Warning "Error when changing license on $User`r`n$_"
Write-Warning "$User is not a member of any group, license will be removed... "
Write-Output "SUCCESS: Removed $OldLicense for $User"
Write-Warning "Error when removing license on user`r`n$_"
Hope this helps you if having this scenario, please let me know if you have features requests or other things that can improve the script! This entry was posted in Office 365, PowerShell and tagged license script switch license, office 365 remove license, office 365 switch license, Office365 license assignment; set-msoluserlicense; office 365 license switch;office 365 license removal group, Set-MsolUserLicense on April 22, 2014 by Johan Dahlbom. In this post we will go through how to achieve conditional mail routing in Exchange Online Protection, without the need of having forwarding addresses per user. This means we can deliver incoming emails sent to the same domain to different back end servers, based on other criterias than forwarding addresses, like certain attributes or group membership. If interested in how to do this using the mail users and forwarding addresses method, Andreas wrote a post a while ago about using Exchange Online as a mail gateway for decentalized email domains. Exchange Online Protection is in place for all incoming emails. You have a single Exchange organization, but different servers across the globe. You want to have external incoming emails directly to the correct mailbox server without transferring them trough your WAN connection. DirSync from your tenant to EOP is already activated and in place, which means all users and Groups are already in WAAD. Our incoming email routing will look like in the sketch below, based on AD Group membership. 1. 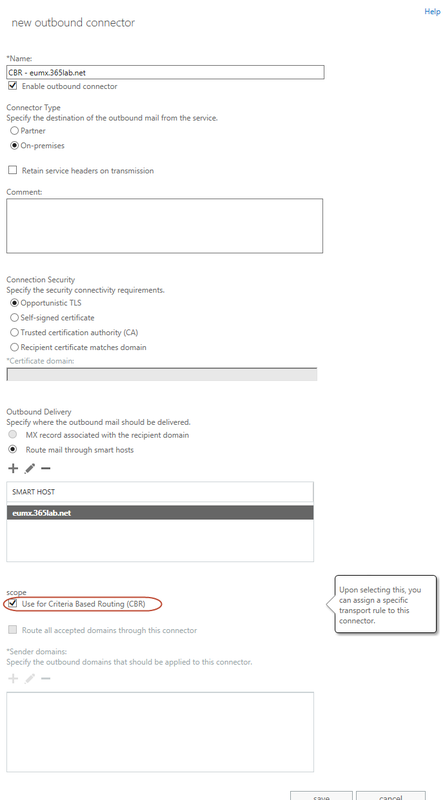 Create an outbound connector with support for Criteria Based Routing (CBR). Of course more than one smart host can be added for redundancy purposes. 2. Create a mail flow/transport rule for each destination connector/ad group. To avoid mail flow issues for users that are not in any of the groups, make sure you keep your existing default outbound connector. 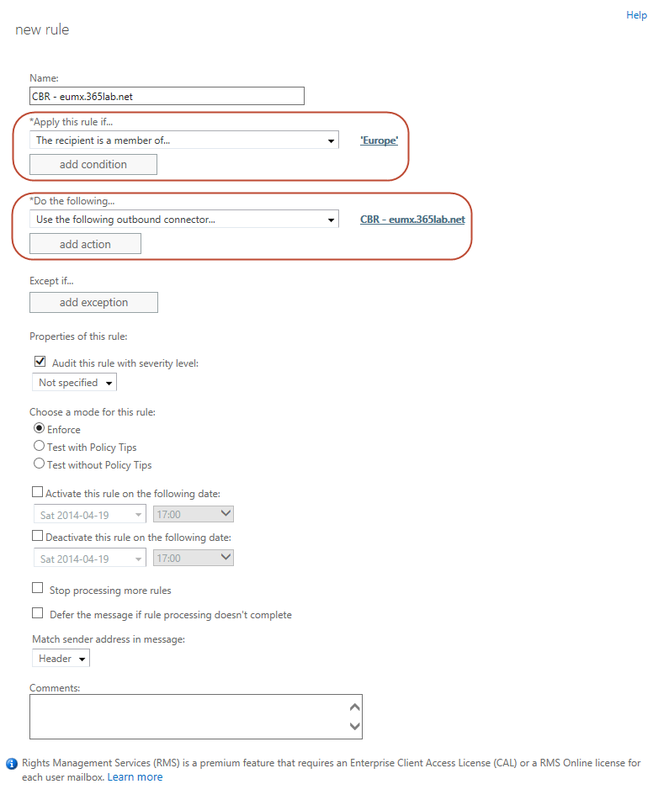 This entry was posted in Exchange Online and tagged CBR Outbound connectors, criteria based routing, email routing multiple server eop, exchange online protection rules, exchange online transport rules cbr on April 22, 2014 by Johan Dahlbom. A while ago I started experimenting with writing GUI applications in PowerShell. This script that updates the thumbnailPhoto attribute of a user was my first attempt, and since it works quite well I thought that I might share it with you. The thumbnailPhoto attribute is used more and more, and it is now supported by Outlook, SharePoint and Lync. It is also supported by Office 365, and when using DirSync the data is synced to Windows Azure Active Directory. This script uses Windows Presentation Foundation (WPF) which is part of .Net 3.0. The window form is easily built with Microsoft Visual Studio Express 2013 for Windows Desktop and can be saved as a XAML document, which we can import in our PowerShell script. Data are saved and retrieved from Active Directory using ADSI, which means no additional PowerShell modules must be installed. The only requirements are PowerShell 2.0 or newer with .Net Framework 3.0. If running PowerShell version 2.0 you also need the -STA parameter to powershell.exe. The application itself is very simple, just type the username in the search box, and browse for a photo. When clicking Apply the image data is saved to Active Directory. By default all users has permission to change their own thumbnailPhoto. To change other users, permissions needs to be delegated. There is a limit in picture size, maximum size is 100 kB, but since Office 365 cannot handle that large image I have set the limit in the script to 10 kB. Also recommended resolution is 96×96 pixels. Here’s the full script, please note that you need a valid path to the .xaml document. Write-Error "This script requires PowerShell to run in Single-Threaded Apartment. Please run powershell.exe with parameter -STA"
Write-Warning "More than one user found. Please refine your search." $file = Invoke-FileBrowser -Title "Choose a thumbnail photo" -Filter "Jpeg pictures (*.jpg)|*.jpg"
Write-Warning "Picture too large. Maximum size is 10 kB." $user = New-Object DirectoryServices.DirectoryEntry "LDAP://$($global:userinfo.dn)"
This is just an example how a useful script with GUI can be written with quite simple means. Now let’s get the camera and take some photos! This entry was posted in Active Directory, Geek Stuff, PowerShell and tagged gui, thumbnail photo, wpf, xaml on April 21, 2014 by Andreas Lindahl. In some scenarios, you may have to transfer the the source of authority for your already cloud-only created user accounts in Office 365. One scenario when this is required, is when changing from cloud only identities to synchronized identities from your local Active Directory. Another scenario is when you migrate your AD users from one domain to another, as described in this post. To make the transitioning to DirSync as smooth as possible, you have to take a couple of precautions to make sure that existing Office 365 accounts are properly matched with the accounts in your local Active Directory. Soft matching of each user. For a soft match to properly work, you need to make sure that the primary email address (both in mail and in proxyaddresses) and userprincipalname in the cloud and in the local Active Directory matches. For the users that are to be matched, construct an ImmutableID for each user in the local AD and synchronize that value to WAAD prior activation and doing the first Directory Synchronization. The ImmutableID is basically a Base64-encoded value of the ObjectGuid attribute. To make this transition easier, I have created a script that and copies the required attributes from WAAD to your local Active Directory automatically. The script can use both methods to match the users. If using the -UpdateImmutableID switch, an ImmutableID will be created for the user and synced back to WAAD. Please note, that process will only work without additional steps if you have not been using DirSync before. With the -CreateNewUsers switch, you have the possibility to let the script create users that are in WAAD but not in your local AD. The SamAccountname will be “firstname.lastname” and a random password will be generated for the new user. Note: a pre-requisite for the script to work properly is that you’ve already populated the UserPrincipalName attribute for all users in your local Active directory. Of course this must match with the UPN’s used in Office 365/WAAD. Script that synchronizes attributes from users in WAAD to the local active directory. Constructs and inserts the ImmutableID attribute in WAAD. OU to create new users in. Creates new users for users that are not matching the WAAD users UPN. Write-Output "SUCCESS: Updated $($ADuser.userprincipalname) with proper attributes from WAAD"
Write-Output "SUCCESS: Created user $sam with password $NewUserPassword"
Write-Warning "User $($WAADUser.UserPrincipalName) is not in AD, user might not be synchronized correctly or become a duplicate user.`r`nCreate the user manually or run the script with -CreateNewUsers switch." #If UpdateImmutableID switch has been used, construct and set ImmutableID for the WAAD user. Write-Warning "Error when updating ImmutableID $ImmutableID for $Mail`r`n$_"
Write-Warning "Error when creating user $Mail`r`n$_"
Good luck running the script and with your Dirsync implementation! This entry was posted in Active Directory, Office 365, PowerShell and tagged aad to ad, azure active directory to active directory script, cloud to dirsync script, migrate from cloud to dirsync identity, sync users from aad to ad on April 18, 2014 by Johan Dahlbom. Update 2016-01-07: Updated the script with a new function to support nested groups. As a follow up to my earlier post about assigning Office 365 licenses based on ad attribute, I’ve now created another script that uses another approach to assign the licenses. Instead of using ad attributes, we are here using security groups to assign the licenses. Since you want to automate license assignment, I am assuming that you are using DirSync. In this script, the groups and group members are enumerated directly in Windows Azure Active Directory. This means that the groups you will use to assign licenses, must be synchronized to WAAD. If you are looking for a more advanced script with change and removal functions, check this one out. Note: Users that already have a license are not processed by the script, nor are licenses removed from users that are not longer member of the groups. Getting started with the script is very easy. In the $Licenses hash table, you define the licenses to assign, the group to use for assignment and the license SKU. Here you will find a good translation table that will help you interpret the License SKU ID to the actual license type. When you have done that, just to put in your O365 credentials and UsageLocation in the script and then you’re all set to schedule the script. #2016-01-07 - Updated the script with a new function to support nested groups. #Note - the Script Requires PowerShell 3.0! throw "Not connected to Azure AD, run Connect-MsolService"
Write-Output "Successfully licensed $User with $license"
Write-Warning "Error when licensing $User`r`n$_"
Looking for other script options using groups? Office 365: Assign licenses based on groups using PowerShell – Advanced version – adds and removes licenses for the users as well. 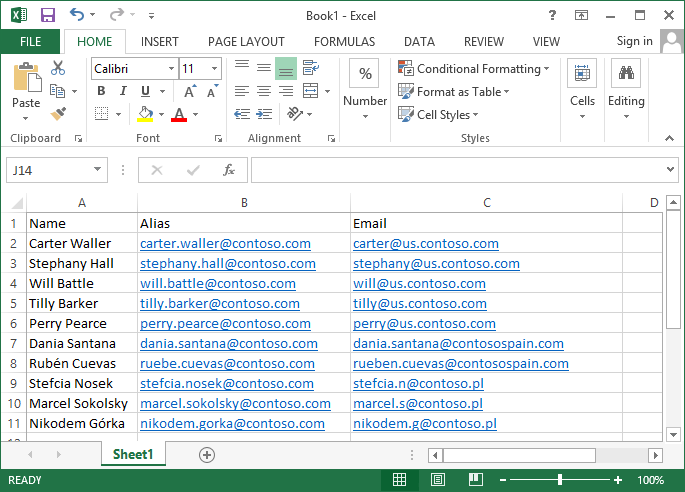 Office 365: Assign individual parts of licenses based on groups using PowerShell – script with the ability to add and remove serviceparts of a license. There are lots of things that are not in the script that could also be automated, please help us prioritize with the features you’d like to have the most. This entry was posted in Office 365, PowerShell and tagged Assign Office 365 licenses powershell, Licensesku, Office 365 License Assignment, Office 365 license powershell, Set-MsolUserLicense on April 15, 2014 by Johan Dahlbom. In some scenarios it is useful to have a central email server that forwards messages to different email servers. You might for example have a company with different business units, each having an email server of their own. In this post I will show you how to get started with the mail flow using one domain, but with several different email servers in Exchange Online. A new corporate policy states that all users must have an email address of the form givenname.surname@contoso.com. Also, a central antispam system must be used. At this point no consolidation of email servers will be done. Exchange Online Protection licenses has been bought by the company. Now all emails sent to the @contoso.com addresses will be delivered to the current regional email server. The next step would be to configure each email server to use @contoso.com as from address, and only accept incoming emails from Exchange Online. This entry was posted in Exchange Online and tagged mail forwarding, mail gateway, postfix, smtp relay on April 11, 2014 by Andreas Lindahl. This is an issue that I’ve been seeing a couple of times, but a couple of weeks a go, a nice colleague of mine helped me find a more sustainable solution in that particular case. When you are using Dirsync to synchronize your users from your local AD to WAAD, quite a lot of attributes follow your synchronized objects to WAAD. The problem with these attributes are, that they prevent your Lync Online users to be provisioned. Option 1. 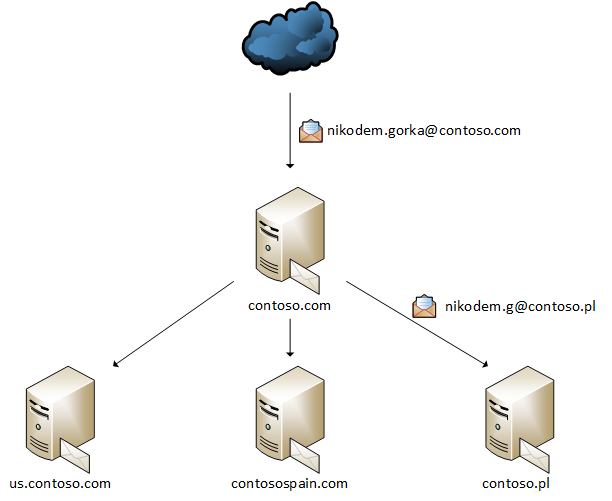 Setup your Lync Server as a Hybrid deployment, as described here. The problem in my particular case was that the Lync deployment the customer had, did not include an edge server, which is required for a hybrid deployment. Option 2. Clear the msRTCSIP-* attributes for all Lync users on premise. This is an option that works very well in smaller environments where you are not required to do some testing before rolling a solution out. 🙂 Since you’re clearing the attributes, Lync for the affected users will stop working on premise. After clearing the attributes, you first need to force a synchronization of Dirsync, and then you do of course need to repoint your Lync related dns records to Office 365. Option 3. 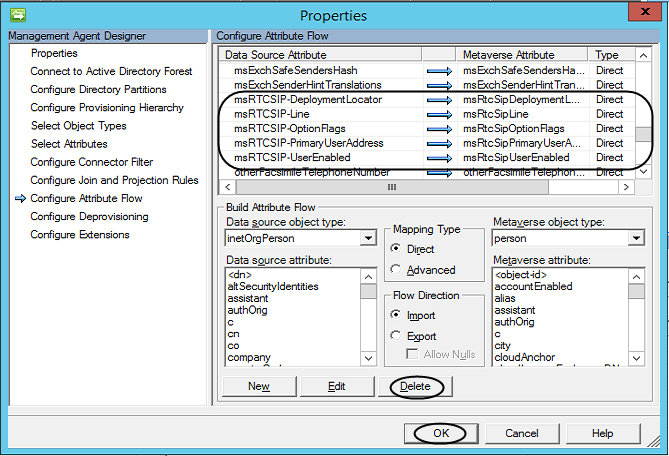 Exclude the msRTCSIP-* attributes from the Directory Synchronization. This is something that is needed if you want to try out Lync Online for a couple of users before moving them all to Lync Online. Note: this requires some ‘major’ Changes in the Synchronization service that Dirsync runs on. Do the steps with caution! 1. Start the Synchronization Service Manager (miisclient.exe) on the DirSync server. 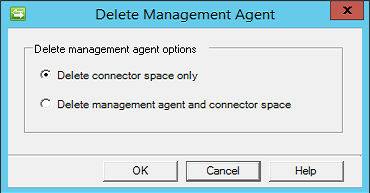 In the “Management agents” pane, select properties on the Active Directory connector. 2. 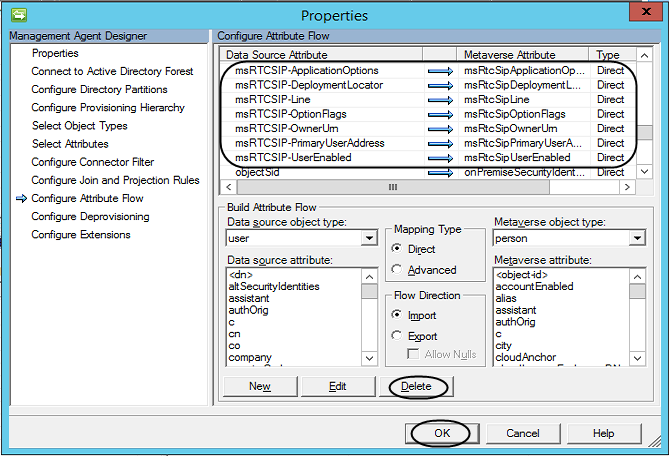 In the management agent designer, select “Configure attribute flow” and remove the msRTCSIP for both the User and inetOrgPerson Data Source from the attribute flow as below. Note that you can only remove one attribute at a time. 3. If you have not yet made your first Directory synchronization, you’re now all set to to do that. If not (which probably is the case since you found this post 🙂 ), you need to to clear the Active Directory Connector space before the problem will be solved. This operation would be equivalent dangerous to installing a new DirSync server in the same domain, e.g. no worries at all. 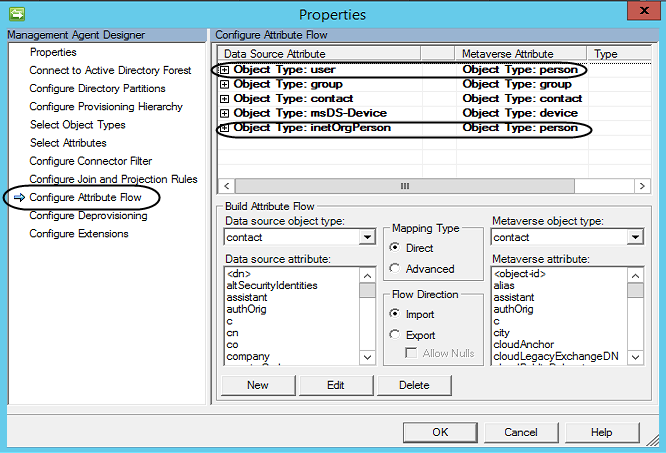 You will not lose any custom settings as OU or custom attributes that you are using to set your DirSync scope. After the connector space has been deleted, run a Full Dirsync again, wait around 30 minutes and hopefully your Lync Online users have now been provisioned properly. Hope this helps you if running in to this problem, and remember that it’s always more than one solution to a problem! This entry was posted in Lync Online and tagged DirSync users not provisioned lync online, exclude attributes dirsync, Lync Online Users not provisioned, msRTCSIP-ApplicationOptions, msRTCSIP-DeploymentLocator, msRTCSIP-Line, msRTCSIP-OptionFlags, msRTCSIP-OwnerUrn, msRTCSIP-PrimaryUserAddress, msRTCSIP-UserEnabled on April 6, 2014 by Johan Dahlbom.